If you have been hiking for quite some time already and are looking for your best hiking GPS device yet, then look no further. This may be the perfect place for you to start. Here I guide you through a detailed description of top hiking GPS devices (handhelds and watches) and what I personally consider the best pick which may soon take your hiking experience to a whole new level. Whether you are a casual hiker or a summit hiker, this article is going to help you choose the right device for you. Through the generations, technology has remarkably evolved to cater the increasing needs of people in a rapidly-changing world. One of the innovations that have taken the modern world by storm is the Global Positioning System. GPS is a satellite-based navigation system where orbiting satellites send unique signals and precise information of their current position in space back to earth. Your device then analyzes such signals in order to calculate the coordinates of your location. Simply put, a GPS device tells you exactly where you are on the planet by analyzing signals received from satellites that orbit the earth. In fact, your smartphones, car, or even your smartwatch are already equipped with this life-saver. Credits to the brains behind this cool invention. Trivia: The GPS was developed in the 1970s by the US Military as a crucial tool for war. A literal life-saver, GPS is one of the best must-haves whatever type of hiker you are, because it can save you from the most unexpected and unwanted occurrence that may arise from your usual hiking experience - that is, losing track. It is good to keep in mind that many have exposed their lives to complete danger to what is considered a very fun and gratifying activity. There's no better way to enjoy and make the most out of your hobby than making sure you're going home safely at the same time, right? So aside from getting your hiking gear ready, don't forget to keep your hiking GPS device handy. A good hiking GPS would be your best hiking buddy because it gives useful and relevant information about your current position, the tracks you have traversed, and your target location. Most importantly, it helps you get back safely to camp or to where you started; perfect if unfamiliar territories like the woods or the summit are your thing. Imagine using Google Maps on your smartphone but in a more sophisticated, precise, and user-friendly manner. Unlike smartphones, hiking GPS devices are specially built for this purpose and can give you a better and detailed view of the map and the terrain. Most importantly, they can work perfectly through unexpected conditions such as bad weather which can significantly reduce visibility. If you want to know more about the Global Positioning System, this link can provide you with supplementary information. In choosing the right hiking GPS that best suits your needs, you may first want to identify what kind of a hiker you are. Your choice is always contingent on your style and preferences. If you are a casual hiker, you may not want to spend some extra dollars for a device perfect for a summit hiker. However, it is paramount to know the important range of capabilities of these devices in order to decide which one is perfect for you. For convenience and portability, it would be best if you opt for a lightweight unit especially if you’re into long-distance hiking. Generally, these devices are made handy allowing you to hike “with ease”. However, some of these devices weigh lighter than the other; and if you prefer a larger screen size for better readability, then you would have to go for a larger device. Hiking – especially summit hiking – is no walk in the park. You will encounter rugged terrains and extreme weather conditions exposing your device to wear and tear. With that in mind, aim for a durable, waterproof, and shockproof device that can withstand the harshest of conditions. Aside from their stylish appearance and modern features, touchscreens allow you to navigate your device faster than buttoned models. However, if you’re into winter hiking, buttoned devices would be the best choice since they are perfect to use with gloves on, are more durable, and can work perfectly under extreme weather conditions. This is one of the crucial things you’ll need to consider in choosing your hiking GPS device. The last thing you would want to happen is running out of battery in the middle of nowhere. A wise advice: Go for a device with a dual battery system that supports both rechargeable and disposable batteries. Most of all, don’t forget to take some of those spare batteries with you. If summit hiking is your thing, this is a significant feature to consider since this will provide you with more accurate elevation readings. Some units are capable of measuring only the altitude while units that feature the barometric altimeter help you to forecast weather trends by determining atmospheric pressure. GPS watches, on the other hand, can trigger an alarm if there is an upcoming storm, thus helping you make important decisions before the storm strikes. Compass – Electronic or Differential? The best thing about an electronic compass is its ability to read your direction without you having to move. The differential compass, on the other hand, needs to detect movement first before showing you your direction. If you intend to share maps, routes, waypoints, and geocaches to your hiking colleagues, then you might want to consider a unit equipped with Bluetooth technology. If you find it a hassle to keep taking out your smartphone from your backpack every time you hear it sound, this feature will offer you a quick fix. This is undoubtedly one of the best features in my list since it allows you to sync your smartphone with your GPS device making it possible to receive notifications such as missed calls, messages, or even social media updates straight to your GPS screen. While the Global Positioning System is managed by the USA, Globalnaya Navigazionnaya Sputnikovaya Sistema (GLONASS) – an alternative to GPS – is managed by Russia. The combination of both networks greatly improves your device’s performance and accuracy especially if you move through heavily covered areas and deep canyons. Another great news is that some devices are already WAAS-enabled (Wide Area Augmentation System) refining the accuracy of your device to an even greater extent. Geocaching is a real-world, outdoor treasure hunting game where participants search for the hidden geocache (container) with the help of their GPS device. These geocache containers hold friendly items that you can take for yourself in exchange for another. Some units are designed to be geocache-friendly and are pre-loaded with tons of geocache locations. If you haven’t signed up for this fun activity yet, click here and start discovering delightful finds for yourself. Undeniably an exciting feature, you can now take pictures of that jaw-dropping backdrop without the hassle of taking out your smartphone or camera. When push comes to shove, the best thing that your unit can do is to allow you to initiate communication either through voice call or text message to inform your hiking colleagues about your whereabouts, most especially if you’re stuck in an emergency. Some hiking GPS devices feature the breadcrumb or cookie crumb trail recordings that show the track you have traversed in dotted lines. They also allow you to mark waypoints which are points of interest or landmarks that you consider significant. The TrackBack feature works best in retracing the steps you have taken and in helping you get back to where you started. If fashion is a huge factor for you, there is a wide range of styles and designs to choose from depending on your taste. Some GPS watches are now built with a sleek and classy design so that you can confidently wear them anytime, anywhere. Some GPS watches already have built-in sensors in them that serve to monitor your heart rate and the intensity of your movements by reading the pulse at your wrist. There are also models that support chest straps which are considered to be more accurate in keeping tabs on your heart rate since they are situated close to your heart. If it is important for you to keep track of your health especially if you’re on a difficult or challenging terrain, this feature may be one of the best things your device can offer so you may be able to assess whether or not you should go further. With this feature, you can upload and download relevant information such as weather trends between your watch and your other devices. Since watches have small screens, you can upload routes and other trail data straight to your laptop for a more detailed and amplified view. I consider this a very helpful feature since this will alert you in cases where drastic changes in the atmospheric pressure occur. You will be notified hours before a storm hits so you may be able to head home or find shelter right away. 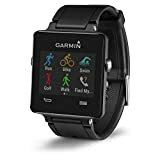 Since watches generally have small screens, it does make a difference if you choose a GPS watch that offers a good resolution. A high-resolution watch offers good readability especially since the texts and data would appear really small on the screen. If you want an uncomplicated interface, choose a watch that you will feel most comfortable with in terms of navigation. Some of these watches are also customizable according to how you like it. A GPS unit that is packed with sophisticated features is more expensive than that with basic ones. If you are into casual hiking, it would be best if you purchase yourself a good basic handheld unit at a lesser price, or a budget GPS watch instead. If you are more of an adventurous hiker, a mountaineer, or a summit hiker, then you may want to consider upgrading to a cutting-edge unit at a higher cost depending on your needs. In this section, we are going to introduce our picks for the best handheld hiking GPS devices – top pick, best budget, superior battery life, geocaching, and the best high-end unit. At the end of this section, you will find the tabulated specs and features for each of the handheld devices for easier comparison. Our top pick for the best hiking GPS device is the Garmin GPSMAP 64st. I consider this as the most versatile among the rest of the models because it is practically a full-featured device housing essential and advanced features alike, thus giving value for money. It has a durable build (shockproof and waterproof) which makes it ideal for extreme conditions. Laid with buttons, it is practical for use on rainy hikes and especially with gloves on. It uses either the rechargeable NiMH pack or two AA batteries that can last for up to 16 hours. Its notable quad-helix antenna supports both GPS and GLONASS technologies for a more precise locational reading even under heavily covered areas. The Garmin GPSMAP 64st showcases advanced features such as wireless connectivity and smart notifications which allow you to share data with other compatible devices and receive notifications directly from your smartphone. It also features an electronic compass and barometric altimeter for seamless elevation readings and weather forecast. So if you consider yourself a more adventurous hiker, then this model could be the best unit for you. But if you are an ultralight hiker, you would find the bulky structure of this device a downside – which I believe does not weigh down the rest of its excellent features. Note: The suffixes “s” and “t” simply mean that this device supports smart notifications (s) and is preloaded with maps (t). If you are a casual hiker and wouldn’t want to spend hundreds of dollars for a handheld device, the Garmin eTrex 10 could be the best choice waving right at you. Although it houses the most basic features, it is definitely not a disappointment. It boasts of an excellent battery life allowing you to enjoy 25 hours of continuous use. Durable and waterproof, you need not worry if a rainy day is on the way. It is a lightweight unit that also operates with a barometric altimeter and a differential compass. The DeLorme inReach Explorer is going to wow you with its superior 100-hour battery life which is perfect for long distance hiking. One of the advanced features that I like about this model is its SOS capabilities that will connect you to a search-and-rescue center in cases of emergency. You can also send and receive text messages with its two-way satellite communication system. It is equipped with a barometric altimeter, electronic compass, accelerometer, and odometer. You can sync it with your smartphone to receive notifications and social media updates. Wireless connectivity makes it possible to share locational data with your hiking friends. 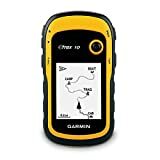 The Garmin eTrex 20x has an internal memory of 3.7 GB plus a microSD™ card slot which allow you to load more geocaching trails and trail maps into it such as TOPO 24K, HuntView, BlueChart g2, City Navigator NT and BirdsEye Satellite Imagery. Its enhanced screen resolution offers good readability even under direct sunlight. Aside from being compatible with GPS and GLONASS, it is also WAAS-enabled for a stronger reception even under heavy cover. This unit is inexpensive, lightweight, durable, and waterproof which is undoubtedly best for geocaching. 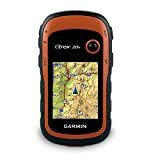 If you are looking for a high-end hiking unit, the Garmin Oregon 650t might be the best pick for you. Its enhanced three-inch adaptive touchscreen provides good readability whether under direct sunlight or shade and is functional even with gloves on. It supports both rechargeable NiMH pack and disposable AA batteries, great when recharging is not possible. When fully charged, battery lasts for up to 16 hours. Its 8 MP Autofocus digital camera with flash – a not so common feature in most handheld devices – allows for geotagging and sharing. It is preloaded with 100,000 topographical data and maps with the shaded relief feature that displays important surface features such as valleys, canyons, mountains and other landforms. It is equipped with an electronic or three-axis compass, accelerometer, and barometric altimeter. This model may cost way more than most other units, but given its superb features, it is definitely worth the extra hundred bucks. Gone are the olden days where watches serve for time-telling purposes only. Today, some watches are now fabricated to accompany you on your adventures to track not just your location, but also your heart rate. Plus, GPS watches are more convenient since they are wearable like any ordinary watch which is best for hassle-free adventures. Those with stylish designs are also perfect for everyday use. If you are an ultralight hiker, this would be a good alternative to handheld devices. However, these watches have lesser features compared to that of handheld units. So it’s up to you to decide. 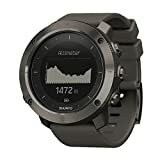 In this section, we are going to introduce our top pick for this category, the runners-up, and the best budget watch for you to consider in your next hiking GPS watch hunting. At the end of this section, you will also find the tabulated specs and features for each of these watches for easier comparison. Our top pick for the best hiking GPS watch category is none other than the cool and stylish Suunto Traverse. What makes this watch stand above the rest is that aside from possessing advanced and trustworthy features, it also showcases an elegant design – perfect to wear even in corporate meetings. The lens is either made of sapphire glass or mineral crystals, where sapphire glass offers more durability and abrasion-resistance. Two of the features that I like about this watch are the heart rate monitor and the storm alert. The heart rate monitor makes sure that your hiking pace is at a steady rate, allowing you to make rational decisions whether to push further or to slow down. The storm alert helps you to prepare in advance so you can find shelter or head home right away for safety. The Suunto Traverse is also compatible with GLONASS technology and provides a breadcrumb trail for you to retrace your steps easily. You can also sync it with your IOS or Android smartphones to receive notifications and social media updates. The sunrise/sunset feature allows you to check how much daylight is left for you to enjoy your hike. Nevertheless, if you plan to camp for the night, you can simply activate its flashlight mode to trigger the torch. It is made of durable materials and is water resistant up to 100 meters underwater – best if swimming is also your thing. It has a battery life of 100 hours which is subject to how often GPS recording is activated. If recording is done every few seconds, then battery life will significantly decrease. In a nutshell, Suunto Traverse is a smart timepiece that comes with all the features you need, housed in a stylish and cool design. The Garmin Fenix 5 is one of our runners-up that can meet your standards when it comes to functionality and style. Made of heavy-duty materials, it is designed to withstand extreme weather conditions without compromising elegance. Featuring interchangeable bands, you can choose between premium leather, metal, and silicone bands depending on your mood. You can also choose between sapphire or mineral glass lenses, although sapphire glass lenses are made to be more durable and abrasion-resistant than that made of mineral crystals. It features a high-resolution, full-color display with LED backlighting for excellent readability even under very bright light or shade. The Garmin Fenix 5 is very versatile as it is good not only for hiking but also for other sports activities such as swimming and running. It also has the capability of monitoring your heart rate with its Elevate™ wrist heart rate technology which is best for hikers and athletes alike. Here, you may check how to improve the accuracy of your watch’s optical heart rate sensor. One of the features that you may like about the Garmin Fenix 5 is its ability to support apps and widgets for customization so you can easily see important information such as weather forecasts. You can also sync it with your smartphone to receive notifications and updates. It comes in three different sizes to choose from – Fenix 5S (42 mm/1.7 in. 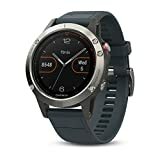 ), Fenix 5 (47 mm/1.9 in. ), and Fenix 5X (51 mm/2.0 in.). The Suunto Ambit3 Peak HR has made it to our runners-up list because of its durability, versatility, and functionality. If you engage in a variety of sports, this watch may be a good pick because aside from its ability to track your location, it can also track your distance, speed, pace, and even your heart rate. It also features step and calorie tracker, which works best if losing weight is also your goal. If used only as a watch, it will give you 100 hours of battery life. With GPS and heart rate monitor turned on, battery life will be reduced to 24 hours. It is made of durable materials, and its glass lens is of mineral crystal. It can also sync with your smartphone so you can see text messages, missed calls, and updates. It is water resistant up to 100 meters underwater. Its Storm Alert will notify you of an impending storm, and its sunrise/sunset feature helps you keep track of the amount of daylight left for the day. It is equipped with a compass, barometer, altimeter, and thermometer. The Suunto Ambit3 Peak HR only uses GPS satellite system for navigation. Ultra-thin, stylish, and incredibly cheap, the Garmin Vivoactive has indeed captured my attention at first sight. It showcases a sleek, high-resolution touchscreen display in color that is perfectly readable under direct sunlight. Unbelievably cheap for the features it possesses, it is no doubt the best budget-friendly watch on my list. The Garmin Vivoactive boasts of its flexibility as it is not only great for hiking, but also for other sports activities such as golfing, running, swimming, and cycling with specific features for each. The heart rate monitor that is worn on the chest wirelessly transmits your heart rate to your watch while you’re on the move. It can also sync with your smartphone for round-the-clock connectivity. Battery life lasts up to three weeks in smartwatch mode and up to 10 hours in GPS mode. Garmin’s Connect IQ™ allows you to download widgets, compatible apps, watch faces (to customize clock appearance), and data fields (such as present sensor, activity, and history). Some of its activity tracking features are the step counter, sleep monitoring, and calories burned. With all these features in mind, I consider Vivoactive a superb choice at an excellent price. Who doesn’t want a touch of music when you’re exploring the great outdoors? Featuring a built-in music player with 3GB memory, the Tomtom Adventurer would be any music lover’s best hiking buddy. Its Bluetooth headphones are sweatproof and waterproof, great for any given weather condition. It also has multisport modes such as trail-running, snowboarding, hiking, and skiing, perfect if you engage in multiple sports. You can also upload your own routes to this watch if you want to discover new trails without the fear of losing track. This smartwatch also tracks your steps, calories burned, heart rate, including your sleeping patterns 24/7. GPS and GLONASS are both Global Navigation Satellite Systems (GNSS) where satellites in each system transmit signals to receivers such as GPS devices back to earth. These signals are then analyzed by these receiving devices in order to identify the accurate location of the device user. The Global Positioning System was developed by the United States and is comprised of 31 satellites that orbit the earth. The Globalnaya Navigazionnaya Sputnikovaya Sistema (GLONASS) was developed by Russia and is comprised of 24 satellites. Your device will perform best if these two navigation systems work together since they provide you with a better reception and a more accurate locational reading compared to just using either one of them. A greater coverage is achieved especially since there are some places on earth where either one of them cannot pick up your device’s signal. The dawn of GPS-enabled smartphones has allowed us to get to our target location right at the tip of our fingers. Gone are the days of mobile phones with their black-and-white screens and whose primary purpose is to send and receive voice calls and text messages. On a personal note, my smartphone has made a difference in my everyday life; and that includes navigating from one place to another without the hassle. However, when compared to dedicated handheld GPS devices, smartphones are no match when it comes to conquering unfamiliar territories. The following are the reasons why it’s best for you to invest in a dedicated handheld device for hiking rather than relying on your smartphone. 1. Dedicated handheld devices are more durable than smartphones. While your smartphones can easily break after a single drop or can stop operating properly when submerged in water, dedicated handheld units are made to be shockproof and waterproof so they can withstand the harshest of conditions. 2. They support traditional batteries which can easily be purchased. While smartphones need chargers when the battery runs out and buying spare phone batteries is not practical, handheld units support traditional batteries such as the AA batteries. You can conveniently take these tiny power banks in case your device runs out of power in the middle of nowhere. 3. They have better satellite reception. Smartphones do not support extensive off-trail navigation because they don’t have direct line-of-sight to satellites compared to dedicated handheld units. With this in mind, smartphones are not just the best for unfamiliar terrains and heavily covered areas such as canyons and forests. Most of the handheld units support two positioning technologies for a greater coverage and for a more accurate locational reading. 4. They are equipped with vital sensors that are not normally found in smartphones. The barometric altimeter provides accurate elevation readings and helps forecast weather trends for you to be able to find shelter once an unfavorable weather is on the way. 5. You can share tracks, routes, waypoints, and other data to your hiking colleagues. Sharing of these data is possible with compatible devices. 6. Some dedicated handheld GPS units support two-way satellite communication system. They allow you to make voice calls and send and receive text messages when you are stuck in an emergency in an area where reception is poor. Others, like the DeLorme inReach Explorer, can trigger an SOS which will connect you to a search-and-rescue center. Smartphone GPS, on the other hand, is ideal for local hikes or established routes where you don’t need to explore unfamiliar territories. You can download certain apps for hiking on your phone that may work well for you. If you are a beginner, it would be best if you start navigating with your smartphone first while you gauge your needs. This way, you will be able to identify whether or not you will need to upgrade to a dedicated hiking GPS device. Although handhelds look bulkier than that of GPS watches, they provide more reliable features and are more preferred for extreme hiking over these GPS watches. One of the best things about the latter is that they are small and wearable, thus promoting convenience and style. They are also more versatile as they are not only great for hiking, but also for other sports activities like swimming, running, and golfing. For the more adventurous hiker, handhelds are more reliable as they are more durable and are packed with more features. The watch, on the other hand, is a good alternative to handhelds for the casual and ultralight hiker. Taking all these things into consideration, a dedicated handheld GPS device is our overall choice when it comes to hiking. And the best of the bunch is no other than the Garmin GPSMAP 64st, a representation of durability, endurance, and functionality at a fair price.